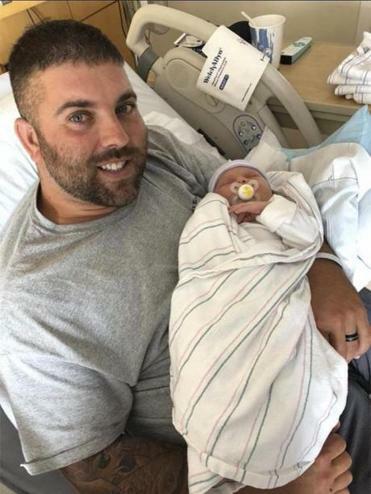 Kevin Quinn, of Mashpee was killed on Saturday a little after midnight in a motor vehicle crash as he was returning home from visiting his wife Kara Sullivan and their newborn baby daughter at the maternity department of Cape Cod Hospital. A Mashpee police officer alerted a dispatcher early Saturday morning that he was pursuing a Toyota that was driving erratically and speeding. Kevin Quinn and his daughter, Logan Audrey Quinn, who was born at 2:19 a.m. July 25. The car had collided head-on with an SUV driven by Kevin P. Quinn, a new father on his way home from a hospital visit with his wife and newborn daughter. 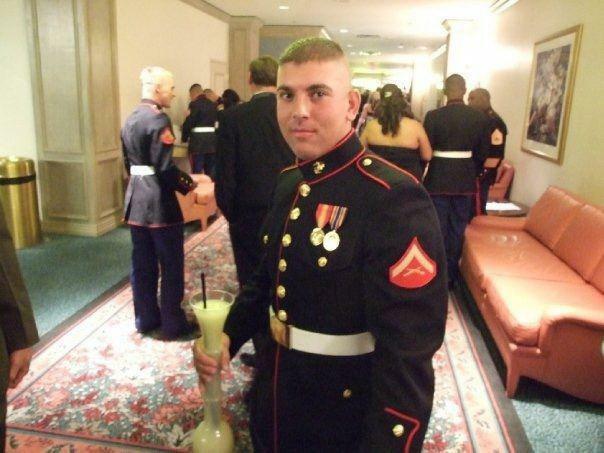 The 32-year-old Mashpee man had survived two combat tours in Afghanistan as a Marine. The crash on Route 28 in Cotuit pinned Quinn inside his 2012 GMC SUV. He was freed with the Jaws of Life but died at South Shore Hospital, Cotuit Fire Chief Paul Rhude said. The force of the impact ripped the 2000 Toyota sedan in two, ejecting the driver, 22-year-old Mickey A. Rivera, of Fall River, and his passenger, Jocelyn Goyette, 24, of New Bedford, Barnstable police said. Rivera was pronounced dead at the scene, and Goyette was in critical condition Sunday at a Boston hospital, according to police. Now as police in Barnstable and Mashpee are investigating the accident, community members are raising money for Quinn’s family and had collected more than $75,000 by Sunday evening. 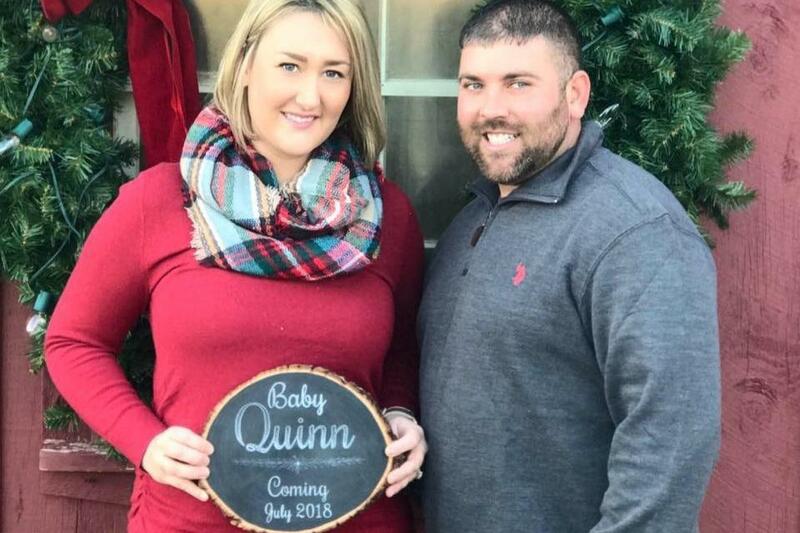 Quinn and his wife, Kara, were celebrating the July 25 birth of their first child, Logan Audrey Quinn, according to Dinan. The Mashpee couple married last year. Quinn had spent Friday evening with his wife and daughter in the hospital and was planning to return later Saturday to bring them home, Dinan said. In a photograph posted to Facebook Saturday, Quinn appears as a proud, smiling father, with his little girl in his arms. “He was just very excited about his daughter being born, and being a dad, and having this life they had envisioned,” Dinan said. Relatives of Rivera and Goyette could not be located Sunday evening. In separate statements Sunday, police in Barnstable and Mashpee offered condolences to the crash victims and their families. Neither agency commented on details leading up to the crash. The officer who was pursuing Rivera immediately called for help following the crash, according to the audio transmission recorded by Broadcastify. “We need multiple rescue units,” the officer said seconds after the crash. The speed limit on that section of Route 28 varies between 45 and 50 miles per hour, according to Barnstable police Sergeant Eric Drifmeyer. Norwood Police Chief William Brooks III, a former president of the Massachusetts Chiefs of Police Association, said deciding whether to chase motorists or let them go can be one of the tougher calls a police officer must make. Brooks declined to comment specifically about the Cotuit crash, noting he wasn’t familiar with the details. He said it’s up to each individual police department to set its own protocol regarding police pursuits of drivers. “There is no one centralized pursuit policy,” Brooks said. Quinn’s sister, Danielle, posted a message on Facebook thanking supporters for their love as the family struggled through a difficult time. Quinn was proud to be a husband and “his girls were his EVERYTHING!” she wrote in the post. “Please in his memory help us take care of his girls as he was a local business owner and this is an extremely difficult situation. He should be here and was so excited to bring his baby home. I LOVE YOU KEVIN and I will Miss you everyday of my life,” she wrote. Quinn served in the Marines from 2008 to 2011, including two combat tours, Dinan said. For the last few years, Quinn owned and operated Mashpee-based Quinn’s Excavation & Septic Inc., Dinan said. Quinn was also part of a close-knit group of Marines who live on Cape Cod, said Dinan, who served as a Marine in the late 1970s and early 1980s. Dinan said that “brotherhood” is stepping forward to support Quinn’s family. “When something happens to one of us, it happens to all of us,” Dinan said. Lally’s thoughts were with Quinn’s wife and child Sunday. “He would have been a great father, but now he isn’t going to get the chance. It’s unbelievable,” Lally said. Quinn, in an undated photo. John Hilliard can be reached at john.hilliard@globe.com. Thomas Oide can be reached at thomas.oide@globe.com. Jeremy C. Fox can be reached at jeremy.fox@globe.com.